As the article states, the loonie (Canadian $1 dollar coin, for those unaware) is forecasted to continue its slide against the U.S. Greenback, perhaps to an (shudder) all time low. Grim things for some in the Canadian economy, but probably pretty good for Lego investors up north. The forecast also indicates this low rate might be the norm until 2018 although I hesitate to put much stock in a prediction that far off. So, my spin – feel free to disagree or grab pitchforks, or agree heartily and raise a toast to me in the comments. #1 Cheapest Lego Sets in the World? I'm no math-magician – I'm an English teacher, damnit, but if these forecasts are correct it will be cheaper to buy some (if not all) sets in Canada, especially a slew of sets that have a small current price gap compared to the US. Fairground Mixer, Slave 1, etc (the list is long). A 20 or 30% discount in Canada might now give Canadian buyers a buy-in on sets that would rival some of the greatest TRUTH Tactics deals I've seen or super-out-of-the-way-major-discount finds in the Daily Deals US/CAN thread (which are mostly US deals). For sellers close to the border, stock runs to Canada might be more common, or bulk buys from Brickpicker to Brickpicker across the border. I know some US 'pickers are already buying exclusives in Canada, but I'd expect that number to grow if the advantage continues to widen making it financially feasible/more enticing for our southern brothers/sisters to come north to buy. Right now Canadians are at a small advantage – another 10 cent drop pushes that advantage noticeably. For me, the U.S. Market sets Lego prices in Canada, and I use them as a baseline when pricing items. I assume a lot (if not almost everyone) does the same. In the last few weeks I've sold a few sets to US buyers after not selling much in the previous entire year. Coincidence? Perhaps. I do know that even with higher shipping costs (on average, based on BP threads and info) from Canada, the slide of the loonie more easily allows me to attract US buyers and opens up a new marketplace for me (and other Canadians) that earlier either couldn't or wouldn't be able to compete with US sellers. I think over the holiday season, over a hundred Sea Cows were sold to Canadians (likely mostly investors, including yours truly!) with many getting them for $175 or $180 CAD, tax in. That is insane! That is about $125 USD according to the currency exchange site I punched these numbers into. If Canadians can continue to get great deals in addition to a favorable exchange rate, US investors might find the marketplace even more crowded than before. I'd say buy in price and set choice becomes even more important in this environment. In addition, for those buying on credit or accruing debt, more potential sellers (Canadians) that are already good at listing, printing labels and being pretty efficient entering the market should breed more caution. The investor with the lowest buy in can undercut others (if necessary) either forcing competitors to take a loss or hold sets longer. I know the Sea Cow is 'hot' right now, but there was likely enough stock sold at rock bottom prices in Canada to effectively undercut most sellers on eBay for quite some time. Of course, there are plenty of other factors, but the Sea Cow seems to me to be an example of how a cheap loonie coupled with good Canadian deals could really affect the reselling marketplace in at least the short term. Tough to imagine that The Lego Group will keep Canadian prices cheaper or even balanced relative to American prices if the loonie indeed loses value and stays low until 2018, as predicted. Future sets might get a new pricing structure. A worst case scenario would be a new pricing structure on all currently available sets, suddenly decreasing the pricing advantage in place now. For global users, I don't know if this will impact you much, but it could be a heads up that currency fluctuations should be part of your investing homework (I did mention I'm a teacher) as changes in your region/target markets will happen and you need to be able to adapt and try to make the situation work for you and your bottom line. Even though I am not Canadian, I appreciate learning the possible advantages in different regions of the world. 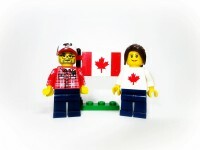 Veegs can be Prime Minister of Canadian LEGO Investing!! So would it be better to sell in CAD or USD? I try to sell in USD and match whatever the going rate is but I think now that the dollar is so low, less Canadians will click buy. My passport is on standby, I am about 6 hours away from the boarder.. weekend trip anyone? I only sell in USD. That is the currency of eBay. Canadians are used to dealing with the conversion whether high or low. Savvy Canadians should not be buying full priced 'collectibles' now anyways. If they are smart they bide their time and wait until the dollar is 85cents or higher again. Also let's hope LEGO doesn't up the across the board price hikes on sets soon. Or we may find buying 2016-2017 (and beyond) sets less lucrative. Usually there is a 12-18 month gap between production costs and retail costs and this is best illustrated by the retail prices of books but Lego Group might be aware that they can't simply bump the price up by another 30% and keep the same level of sales and profits. I am very surprised that prices haven't gone up yet and expect them to be raised by the fall. There is a member here who has been taking advantage of this arbitrage opportunity for quite awhile with quick flipping. Since it is not convenient for me to drive over the US easily, I have enjoyed the very large gains for EOL sets only. Anyone close to the border, it is easy money for the $200 US / $230 CDN priced sets. Unless you're buying sets at some % of discount, is there any profit buying at retail costs + taxes + selling fees for the $200 sets even with the current advantage of the exchange rates? I guess it depends on the province you live in, and I would assume at least the 5% VIP program + CC rewards cash. I am not saying there is huge money to be made, just saying the opportunity is there. My US sales have skyrocketed which is great! I can list something at an inflated CAD price (knowing the USD worth) and have it sell despite the higher shipping costs for the buyer. i think i need to post some more listings in CAD. It's good to sell to both countries for sure, but I've had my best year ever from selling here in Canada as the loonie has fallen. My amazon prices are in CDN but it's clear that buyers are realizing how much the US price would be and opt to buy locally, which allows me to raise my prices. I'm doing just amazon.ca and craigslist/kijiji and loving it right now. Next month will be a good time to get some double VIP action that will make buying exclusives in Canada very competitive. I'm already plotting what I'd like to get a couple more of for sets I *hope/pray* retire in Q4 or earlier.